Hello Codeforces, and happy Nowruz. It's an honor to announce you that Codeforces Round #406 is going to take place on March 23rd. I'm the writer of this round and it is gonna be my 6th CF contest (there are still plenty coming...). There are 5 problems and you'll have 120 minutes to solve them. I'd like to thank keyvankhademi and waterfalls for testing this round, netman and KAN for helping me prepare this round and MikeMirzayanov for awesome platforms of Codeforces and Polygon. The main characters of this round are going to be Rick and Morty!!! Problems are sorted by their expected difficulty, but I strictly recommend you to read all the problems. P.S: Top IOI 2017 participant in each division (only with handle present in the future IOI handle list) will be rewarded with special Persian souvenirs in Tehran. UPD: System test is over, congratulations to the winners. AMD is an absolute champ in preparing nice interesting and original problems. Amd's contests are so good. I've never been disappointed with any of his contests. Looking forward to this Thursday. are you sure then IOI participants has in EACH division? You would be surprised, but as far as I remember the split was 50 / 50 for those with a Codeforces account. "I strictly recommend you to read all the problems" does that related to the difficulty of the upcoming problems??? For example, you are very good at math and E is math problem which you can solve, but you are solving A-B-C and can't solve D, so you can think if I can't solve D, I won't solve E too and don't reading problem. So, it is good to read all the problems. Happy Nowruz! I wish everyone that the round was truly festive! I missed PrinceOfPersia's rounds so much! (only with handle present in the future IOI handle list). Where's that list? "Do ya hear that M-M-Morty? 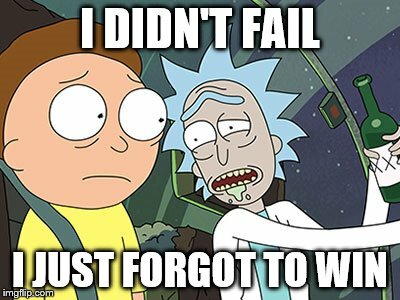 *URP* We're gonna go to a universe where everyone is a character in a programming competition, Morty--"
"I-I, uh, I don't know Rick, that sounds like--"
"A programming competion, Morty! Codeforces, Morty!" I hope this comment becomes the reference for all authors who are lazy to write it , and they write GL or HF . so they can copy paste it from here . First of all I apologise to write it here as I am very much new to this.I want to hack a problem which is already accepted.But I can see that the solution is wrong,what to do,Please Help. AMD setting the round + Main characters as Rick and Morty. This is going to be good. "and I love him too"
Simple answer: because he is PrinceOfPersia. can someone tell me the full-form of amd please? Glad to see my teacher is holding another round, good luck PrinceOfPersia (reply to this comment). Good thing CodeForces doesn't have verdict "Not Acceptable", else this round will be full of Error 406: Not Acceptable. Guys, better prepare robust version of Heavy-Light Decomposition. Afair on 3 out of 5 PrinceOfPersia's contests E required it xD. Yeah, possibility of Div1E being HLD is a perfectly valid reason for greens to unregister ;p.
If E is HLD,then Accordingly all lower problems like D will be of PersistenSe segTree amd c will be of Sqrt decomposition and b will be of Dynamic programming with bitmasking and A will be of Maximal fLow and minimum cut in graph and Div2B will be from suffix trie and then DIV2a will be Unknown theorems on NUmber theory . That's a pretty good and valid point. Guys I have found a genius at sarcasm. Just take my like. Funny fact: in Round #362 problem E was not a hardest problem, but it was indeed a HLD-problem. So, if a problem on HLD appears, it will apparently be the problem E, no matter how many problems in the contest there are. On last Petrozavodsk I used HLD once and it was also problem E (E2) :D. Apparently it was second easiest problem that day xD. fact : PrinceOfPersia is a gay prince and he's trans. Hacking page does not load. Did anybody notice the names of the problems...they are the names of eminem's songs too. This is exactly how I read the problem statements to understand the whole meanings. If suppose somebody program is write but would terminate before considering all the inputs would it be a valid program or not? All that matters is that your output is correct, it is not necessary to take the entire input. It could be better if there were explanations for the examples in Div 2 problem C. It is possible to understand it ambiguously. Div 2 B and C are so ambiguous. There should be more explanation rather than what we had. How to solve C? My idea is to do dynamic programming with 3 state [position][cycle_passed][turn], with O(k) transition. This gives the right answer, however since cycle_passed could exceed 70, my solution got TLE. Am I on the right track here? It needs only position and turn(0 or 1), nothing else. Wouldn't the graph be cyclic? and dp only works on DAG right? With DFS, you could do on graphs that are not DAG either. I used a dp approach too, conf[player][pos] = 1 if player can win if he moves first from pos, 2 if he loses, 0 if it-s a loop. I made a dfs(player,pos) to find the answer for the current configuration but I'm not sure it will pass the main tests because of the complexity . It became a little complicated when taking care of the loops so I had to use some extra time to verify those. Applause Great problems! Thank you, man! on div2b, why no runtime error for negative values on this solution? Could you show the whole code? If you add cout << ok << " " << v << endl; to the beginning of code: You get 0x554ae0 0x4f3040. That means that ok was placed after v (exactly v + 100008 = ok), so in fact ok[-1000] makes sense because it means v[100008 - 1000] (Don't have any idea why 100008 and not 100005, that's some compiler stuff). He wouldn't clear ok after first group, so he will say "NO" after checking 2nd group and finding that there are two elements with absolute value of 10. But right answer is of course "YES". will also have "NO" answer, but the right answer is "YES". I see, so it doesn't give RE only because that memory region is luckily located within the program scope. Well, at least it didn't pass the systest. Thanks for the clarification, it was very helpful! Whats the hack for div 2 A? Whats the answer for it? 10 5 10 7 OUTPUT : -1 . P.S. : I used it twice with affirmative . So many fell to this single test in div 2 B :-P.. I couldn't really understand the statements. I read problem A like 5 times. I guess he meant Div. 1 A . Well you have an infinite game, you have a position and turn. In your turn you take any of your numbers and change position into (position + chosen_number) % n. If you got into 0 -- you win. I think problem E was just a persistent segment tree .Let A be the original array. Make a persistent segment tree B such that position j of the i'th version is 1 if there is no value equal to A[j] between A[i],A[i+1],....,A[j-1]. Once we have this we can do a greedy construction, because we can find the farthest possible endpoint for the next segment in time log(n). B was not easier, A was tricky. I thought this before seeing the main tests. After seeing the main test... well things changed. Pretty nice contest (although I failed). B was really nice but I didn't like A. On C can I coded a solution (which I thought was and I still think so) the idea was that you change the answer at most when you change the K. Also the answers are decreasing so we can do a divide and conquer with at most times computing/doing the O(N) solution for fixed K. Can someone provide a test case which fails that, because it TLEd? Also how to solve D? Is O(n * log23(n)) the intended complexity for C? Then can you give me some hint how to improve this? I used binary search + Persistent IT. Greedily do for K = 1 — 1000 in O(n). Now notice that for K > 1000, answer will be <= 100. Binary search on the range to get answers that lie b/w x for x from 100 to 1. Yes I done on the similar way. my solution is n^2, although I don't know if it a solution quite yet. i think it was very hard round for DIV2 , am i right or not ? I hope 2*10^4 dfs in problem D will fail? In other case I don't understand why it's D. I decided to look at the submitted solutions and it made me sad. He just compressed dfs-es in one in order to jump less over the memory. Actually, that's the usual problem with solutions like O(n*log^10). Yeah, more awesome because so far it is the only accepted solution. harder than usual but problems are so nice! The Russian statements look much like a result of some automatic translation: the order of words is as in English, and sometimes the meaning is messed up, too. Still possible to understand, but English version looks more readable to me. Looked way better when Codeforces had staff dedicated to translating the statements, like Delinur. There should be no Russian at all. Authors should just focus on English. Quite often there was a reverse situation when native Russian speakers didn't care enough for good english statements. The whole codeforces.ru should be translated into english and removed. can't figure out why my solution 25749847 for B is failing. could anyone please have a look. you are using break without reading the whole line..
pain, pain and more pain. thanks btw. Are all round prepared by PrinceOfPersia have a hard Div 1 A? Or am I too weak? This question is so weird. Wait, what? It is said that noone can join the group more than once. Oh god. I got it. I should have read the text better. Ricks and Mortys have registered online in these groups. So, a person can have joined a group more than once (developer of this website hadn't considered this possibility). WHat is the proof Of DIV2 A ? I cant guess the impossible (-1) case . When it will be impossible ? And whats the proof ? What I did was to construct a set of all the remainders i.e. if (b > d) (b-d+n* a)%c and if this doesn't come to zero first but repeats then it runs till infinity therefore -1. Similarly if b <= d.
Sorry I mistakenly read DIV2 B .
a = 2, b = 1, c = 4, d = 4. We are adding even number to odd number, so it will be odd number, but c and d are even, their sum will be even to. this can be solved using extended gcd. if (d — b) % gcd(a, c) != 0 then answer is -1. I tried Bezout's Identity for Div2A . But it failed....can anyone correct me. Also, I can't think of when would it be -1. It isn't a good idea to make Div1 A so difficult. 795 users registered for this Div1 round but only 343 made at least one submission. Please Can someone tell why i got WA in Prob B ? DIV2 B- not afraid . I solved this problem , One submission with break getting WA on test 10 but test case is too long so cant guess the bug — > WA on test 10 , Submission With break statement . Another same submission got AC where i just cut the break statement -> GOT AC submission without break statement . Can not find any short test case which will give the WA for first code . Try this test case: 1 1 2 1 1. The answer is YES. So easy div2 B problem, but so difficult-to-understand problem statement. Puzzle: Name of all problems are names of Eminem songs, except for Div.1 E. Eminem has no song named ALT, so what is the story behind ALT!? Because Encore (mentioned in the statement) is an Album not a Song? Okay, Encore is an album, what is ALT? Could you guys help me with why I got Div2B wrong? I think I misunderstood something. Awesome , I understand what is the problem . Many many thanks . The problem was that when i break middle of the input , the next input data scanned by k , so this cause mulfunction to the program . Awesome hack case . Thanks . My Code failed on #59. Can someone explain me how this passed 58 test cases ! !! Hello, I think I found a mistake in system tests in task B. Time limit is 2s and I've found the test in which solution has been executing for 2.8s but system test said that it is valid. I was able to lock my solution after being hacked. HOW? wasn't the character next to Rick in div1 D (Rap God) Pearl from Steven Universe? Hi guys! In the A problem, why the values of i,j should be lower then N ? There is any relation of this with diophantine equations properties? It meets a RTE with a exit code which usually means array/vector visit out of range. But my vs2017 report nothing and runs well, and I had never disable runtime warnings. So I submited it in MS C++. The first time it runs and I've got a minor mistake. after I corrected it with only one line, it cannot even compile. I got really frustrated. Can someone help? What's going on? Server time: Apr/20/2019 18:17:02 (f2).